That's a pretty good video. A couple of somewhat debatable points, but good for reference for sure. If you combine that video along with the information presented in here, you'll be good, Kazz! Andy_G, but man, that video based on visual signs of subcutaneous fat. And a pic of bigsnake girl is based on opposite point of view - snakes gain visceral (internal) fat first and then subcutaneous fat. Perhaps my English is too poor to make you understand what I am talking about. So I have made a pic. Kazz, I fully understand you. That's why I said to combine that video along with the information presented here. The video is good to show a visual of an obese snake for someone brand new to the hobby. The video is made by a hobbyist with good basic information so that someone doesn't choose a visibly obese snake, and if they have one, it coaches them to put their snake on a diet. The information posted by BSG and backed by me is provided by professionals in the field of anatomical science and veterinary medicine, so far beyond and more in depth than what the girl in the video is talking about, which once again she is talking about the basics and helping people new to the hobby identify possible health issues with visual aid. This has nothing to do with differing points of view as all of the information is objective. The video in no way goes against anything mentioned here so I don't understand why you think the video disproves the accurate and correct information posted in this thread just because it isn't touched upon. The only person or people who would or could make a video about visceral fat would be someone in the field of science, and that is far beyond the people in the video above. That's as clear as I can make it. Last edited by Andy_G; 07-25-18 at 07:32 AM.. I'm not sure if there's a communication error here, or you're intentionally trying to start something. I said, quote, "As far as obesity, it is not always obvious." and then, quote, "and a lot of keepers only know a snake is obese when it becomes that obvious." But, for many species, it doesn't become obvious they're overweight until they're obese. That video is a good introduction to obesity, but several of the points are wrong. -Spines are not a good place to look. It can be hard to tell the difference between a healthy spine look, an underweight spine look, and an overweight spine look. I have seen people mistake morbidly obese snakes with canyon spines as emaciated (where it's sunk in from fat deposits). I have seen people mistake muscle connections as vertebrae. -Ribs showing don't always mean they're underweight. In juvenile boas, their ribs can be easily seen until they gain enough muscle mass to cover them. Even as adults, their ribs can be easily felt, although they may not be visible. Some species, especially highly specialized colubrids, can naturally have ribs constantly showing at a healthy weight. -Some species naturally have a spread to their scales. -Stretchy skin is more a sign of dehydration than being underweight. Even an obese snake can have stretchy skin, especially around the neck area. 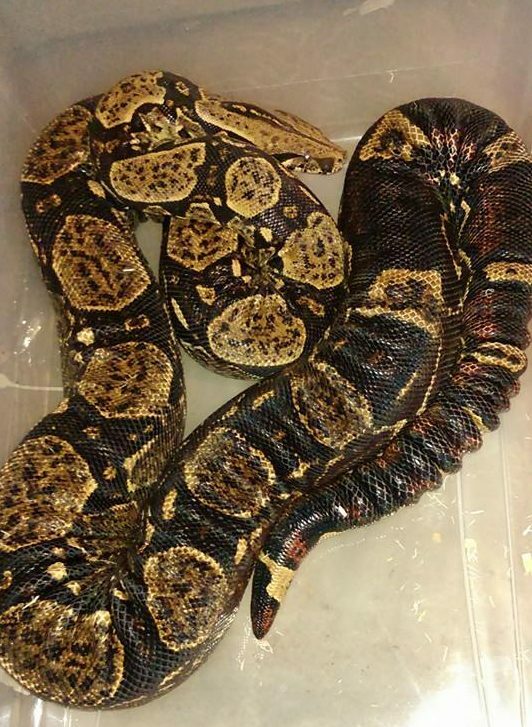 Now, I will admit a particularly obese boa that loses a lot of weight rapidly will gain some loose and wrinkly skin, but that should decrease over time. -The neck: if the neck has a noticeable swelling that travels down the body, it has fat deposits all the way up to the neck and is at the most severe level of obesity. This takes years and years of incredible levels of power feeding to achieve, and are permanent, even if the boa attains a healthy weight. Exactly! That video is very introductory, which means there will be incorrect points, but most of it is very good, and serves the specific purpose of helping new owners recognize already obese animals. Last edited by bigsnakegirl785; 07-25-18 at 07:39 AM..
That photo creeps me out, man. It sounds like you've got a good plan of action Kash. Best wishes with the new boa. Wow I learned a lot from this discussion. bigsnakegirl785,Kazz, I fully understand you. That's why I said to combine that video along with the information presented here. Ok. I see we have no way to see obesity until obesity (is) becoming really obvious and last stage. Last edited by kazz; 07-25-18 at 01:06 PM..